A part of my healthy eating is to include adequate amounts of protein in my diet and limiting excess sugar. Fiber One® Protein Chewy Bars is a delicious way to enjoy a snack that has at least 6 grams of protein, 7 grams of sugar and 20% of my daily fiber values. My family and I enjoyed sampling two delicious Fiber One® Protein Chewy Bars including my personal favorite, Coconut Almond and Caramel Nut. 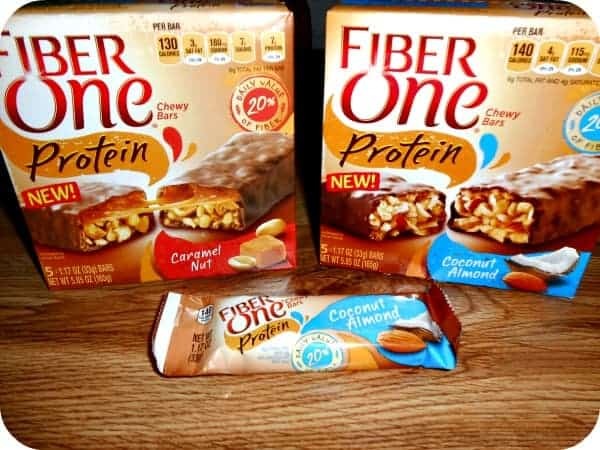 The Fiber One® Protein Chewy Bars in Coconut Almond reminds me of one of my favorite decadent candy bars that I no longer eat yet it is very satisfying and has only 140 calories! I enjoy eating a half of a bar as a dessert when craving a sweet treat or an entire bar if I need a snack when on the go since it is so easy to take one along in my bag when the cravings hit. Each bar has a tasty chocolate flavored coating, whey protein concentrate, whole grains and rice flour. My husband requests the Caramel Nut Chewy Bars to be packed in his lunch box and reports that it helps keep him going on those long hours working the night shift. I love that it keeps him away from the junk food and candy bars frequently luring him in to the vending machines! Fiber One® Protein Chewy Bars are a tasty alternative to sugar laden candy bars and it has been a big hit with my family. There are five bars per pack and Fiber One® Protein Chewy Bars are available for purchase at major grocery retailers for the suggested retail price of $4.19. This is a satisfying, healthier and economical way to enjoy a yummy snack food. ….it definitely satisfies my sweet tooth cravings without all the guilt! You are invited to visit the Fiber One® website to learn more about Fiber One® Protein Chewy Bars and all of the other delicious products available. Which new flavor are you the most excited to try? I’d love to try the 90 Calorie Chocolate Fudge Brownies. Would love to try their Caramel Delight cereal. I would like to try their Chocolate Fudge Brownies – only 90 calories woo hoo! I’d like to try the chocolate chip brownies. Mmm… I’d love to try the 9o calorie Chocolate Fudge Brownies! I would love to try Nutty Clusters & Almonds. I would like to try the Honey Clusters cereal. I heart the Fiber One Caramel Delight Cereal too! I just today bought a box of 90 calorie fudge brownies! Can’t wait for my lunch tomorrow it’s gonna be sweeeeet! Pun intended! 90 Calorie Chocolate Peanut Butter Brownie. The honey nut clusters with almonds sound good! I want to try the Caramel Delight cereal. I’d like to try the Chewy Strawberry PB&J. I actually eat a lot of fiber one products already, I love the 90 cal brownies, the perfect treat whenever I just NEED my brownie fix. lol. These look yummy! Can’t wait to try the coconut ones. I love the brownies. I want to try the 90 calorie chocolate chip cookies! I’d like to try the Cinnamon Raisin Bread! I would love to try their 90 calorie Peanut Butter Bars. i want to try their 90 calorie chocolate chip cookies! I have tried nearly all the fiber one products. I like Fiber One raisin cereal best. I’m looking forward to coconut almond. I wanna try the Fiber One Caramel Delight Cereal too! yum! chocolate fudge for 90 calories? i want to try that! The 80 calorie chocolate cereal looks yummy! Noticed the Fiber One® Cottage Cheese. Would love to try that!